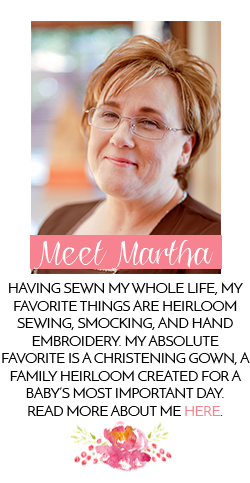 Southern Matriarch: Another "Did You Watch"
Perhaps today's events don't have the same romantic appeal, but an electric one none the less. Today marks the beatification of Pope John Paul II. An event of the same pageantry and awe as the events of Friday. There weren't gowns to see or flower girls to delight but millions of people lined the streets of Rome as well as watched around the world. The day marked the recognition of a life lived in heroic faith and service to others. Beatification and the further process of being named to sainthood, does not "make a saint." It is the Church's way of naming what already is. An official way to declare what has already been done through faith and the grace of God. What all those of faith hope to do, to live in union with God in this life so that we too may live with Him in eternity. 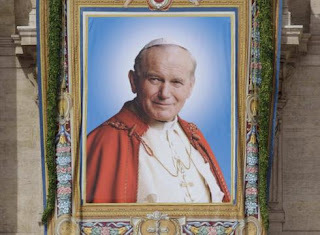 In his first Mass of Thanksgiving upon being elected Pope, John Paul II spoke these words to the faithful that would become a treatise of his pontificate. "Do not be afraid! Open, open wide the doors to Christ!" 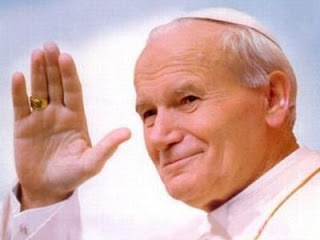 He was a very charismatic man, a media savvy pontiff, a forgiving man, playful, prayerful, as well as a faithful man. He was not perfect as none of us are perfect. That is one of the greatest gifts of the saints. They teach us that even in our humanity, in our frailty, in our imperfections; we are redeemed and how to live a life that speaks to that redemption. They teach us how to stay the course. 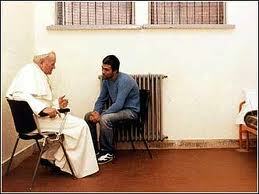 "Blessed are you, beloved Pope John Paul II, because you believed! Continue, we implore you, to sustain from heaven the faith of God’s people. Amen." 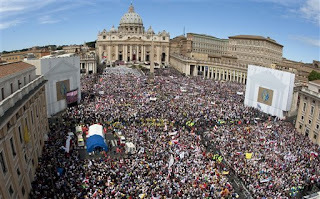 I heard that it was to take place, but since I am not Catholic, it has no significance to me or anyone I know. I am sure those who are Catholic are very pleased that he was rewarded (if that is the appropriate term). I understand that there has been a campaign to do so. More important to me, to my BIL, his aunt's home was obliterated by the tornado in Tuscaloosa, AL. They have insurance, but the process to get housing and some normalcy will take quite a while. It is so sad to see all those who have their homes taken away in just seconds. Was that not awesome! We have friends who went....and although I was pea green, I am not sure I would want to be 1 in a million in this case. thank you for writing such a lovely well worded tribute to this incredible man. whether one is Catholic or not, one should acknowledge the incredible impact JPII had on world history. I am so grateful for his example of love through his whole life 'till natural death.